I did not find this locality to be as productive as the Burns book suggests; however, this is still a very interesting outcrop. The fine-grained sandstones and shales are somewhat fossiliferous, and the coarser sandstones often display bark or tree-branch casts. 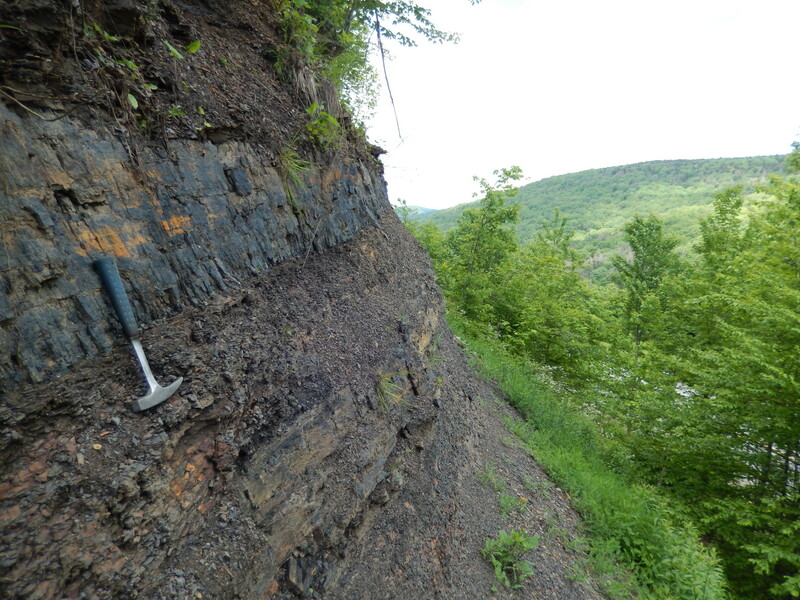 There is also a nice bituminous coal seam at the top of the outcrop. The Highland Scenic Highway is a very nice drive through high-elevation, remote, and rugged Appalachian country. There are many other interesting things to do and see in this area, including Honeycomb Rocks to the north and Cranberry Bogs and the Falls of Hills Creek to the south. There are also several nice US Forest Service campgrounds very close to this outcrop. With so much to do in this area, I highly recommend spending a long weekend there.